This is a simple but very elegant dish. The basic method of baking eggs is always the same, but experiment with different herbs, chilli, lemon, or anything else you fancy. Preheat the oven to 180 ̊C, gas mark 4, and grease 2 shallow, ovenproof bowls with the butter. Cook the asparagus in a pan of boiling salted water for 1-3 minutes (depending on how thick the stems are), until just tender. Drain and run under cold water to cool completely; dry with kitchen paper. Mix the anchovy, parmigiano reggiano, cream and mustard; season (take care as the anchovy will be salty). 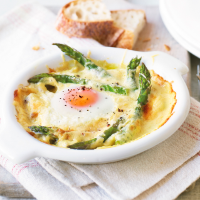 Divide the asparagus and the cream mixture between the bowls and make a well in the centre of each. Crack 2 eggs into each bowl and season. Grate over a little more cheese, then bake for 18-20 minutes, until just set. Serve hot, with crusty bread, if liked.